If you have a good competitive moveset for Swampert, post an answer below and upvote the best ones. Movesets for any of its pre-evolutions can also be shared on this thread. Swampert Pokédex and learnset for reference. As for the water move, I usually like to use Surf, but based on the Type Coverage Tool, the following move types are best if you want to cover a lot of Pokemon's Weakness(es): Rock/(Flying covers more, but that's impossible for Swampert), Ice, Fighting, & Ground - Type Moves. I have 2 Move recomendations for each Type. They are divided between whether the moves make contact with the opposing pokemon or not, except the Fighting-Type Moves, since they both make contact. For those who still want to use a Water Move, You have two choices to choose from, but I recommended the following moves depending on which attack you have for your ground move. Though your free to use both Earthquake and Surf at the same time. Personally, I usually use Surf, but Waterfall may be good too. I never used waterfall with Swampert before, partly/mostly because the battle(s) usually ends with just one attack, (Well, most of the time...), so I don't know how well Waterfall works with Swampert. Also, if your going to make room for a water move, I'd suggest replacing the Ground-Type Move with the Water-Type Move as you would cover more pokemon that way than if you had replaced the Fighting-Type Move instead. Pikamatrics your comments on his movesets are completely uncalled for how about ''Swampert doesn't have very good sp. attack so you should change the attacks but the typee coverage is pretty good'' which is my answer to his. Avalanche is physical by the way. So is all of the listed moves above. Thi Swampert is meant to be a Defensive Pokemon/ Phazer. how do you get stealth rocks on swampert or you cant on x and y? Isn't Swampert a physical attacker? Swampert is a Physical attacker, so there's no point in this. Substitute allows it to pull off Focus Punch and is good all around protection. Focus Punch has very good power and can be used pretty reliably thanks to Sub. STAB Earthquake has very good power as well. Ice Beam rounds out the coverage by hitting Flying types, mainly. Ice Punch can also be used if you prefer to stick to Physical moves. Brave nature is used to boost attack while still not lowering any of the defenses or SpA so Ice Beam can be used. Ice Punch>Ice Beam, due to his low Sp.A. wouldn't it be better for adamant nature so you could have more attack without sacrificing speed? Well, let's see what we have here... Bulky Water type with only one weakness, amazing Attack stat, and can set up Rocks... Let's begin, shall we? Careful raises SpD, not Speed. That's what he put. SpD is Special Defense, not Speed. Spe is Speed. 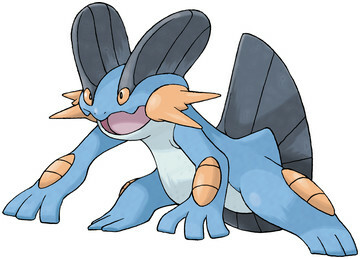 For me this is the Perfect Swampert:Careful! Speed is Spd. Special Defense is SpecDef. Special Attack is SpecAtk. Made this set during my car ride to Florida, just now getting around to posting it up! Item,ability,nature,ev's? You do know this is a moveSET and not just moves. Wide Guard and Roar are handy in that Wide Guard allows your team to avoid spread damage attacks, allowing the partner to avoid damage from the likes of Earthquake, Rock Slide, etc. while attacking the opponent, and Roar can force out a potentially burdensome opponent, like a trick room user (it should be noted that roar has a greater priority than trick room) and disorient the opposing player. The EVs allow Swampert to survive a water gem boosted Hydro Pump from Politoed in rain, Latias's dragon gem draco meteor, and even support Thundurus's Grass Knot to name a few, while also granting Swampert considerable attacking power. Ice punch can be exchanged with Hammer arm. I upvotesd this set because I know what mixed swampert can do to people. Its very good! And gaba, he needs ice punch to blast ice types to oblivion. This one's my personal favorite. Swampert is beast! This was my first post on this website so thanks for reading! Try getting up rain before sending him in, and then just sweep. My favorite set at the moment for Swampert. Can Mega Swampert be a Jolly Nature too to have a good moveset? Swampert is a monster in the rain. Rain Dance is in my opinion, the better option rather than wasting a slot for Politoed in a team, since Swampert definitely has the bulk for setting up a Rain Dance with 100/110/110. Once in the Rain, you can outspeed almost everything barring Scarfed Greninja and kill them with that epic 150 attack with a rain-boosted STAB Waterfall. And lets make use of those good defenses with a ResTalk set to take hits and wear opponents down. Swampert has 336 attack uninvested, so it'll still hit things relatively hard for such a defensive Pokemon. Get in there with STAB Waterfall and Earthquake, then Rest and Sleep Talk for healing and continuing to get damage off. Toxic can also work if your team needs it, or Yawn or Roar for forcing switches. Toxic+Protect is a deadly combo. Earthquake is for coverage annoying Steel types. Avalanche covers Grass Types. Just a note: I use this same set on my Marshtomp, but instead of Avalance use Waterfall, that also works pretty nice for the little dude. Not really, Ice Beam is Special, and I think Marshtomp has bad SAtk. I think that with the speed Swampert has, I won't boost it. His speed is bad, but bulk up would be better so that he can out speed other swamperts. change curse with bulk up and use hammer arm instead of brick break. also, use liquidation instead of waterfall for more power since swampert is slow so it can't flinch. this makes it better for more power and the defense drop. Any Level 100 can beat the Elite 4 in any game. Besides, you have access to Potions and stuff so it is not much of a challenge. These movesets questions are asking for competative movesets where all Pokemon are the same level and Potion-like items are banned. Have you watched the video of how a team of Lv.100 magikarps beat the E4? It's a pretty ok set,but maybe ice punch will be better on Swampert due to his high atk. stat. But other than that, it's you'll faint not fainted. Mainly for UU. 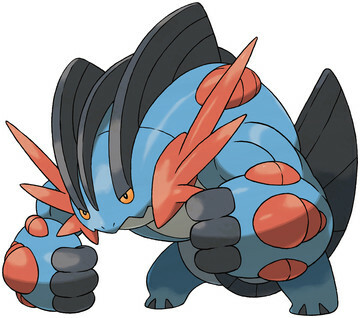 This Swampert aims to stay in on threats that wall it, and destroy them with ease. Roar is a great asset to this Swampert, for if you don't need either of those Moves, replace it with Roar. Standard EVs from TankPert. Ice Beam over Waterfall to destroy those pesky Gligar and Grass Types easier. Snorlax and Porgon2's with Thunder Wave can get destroyed by Hammer Arm.